Nuit Debout, a movement that began in France, continued in Montreal this week. A previous demonstration took place in front of the French consulate on April 22 to introduce the concept to the city and show solidarity with the movement in Europe. 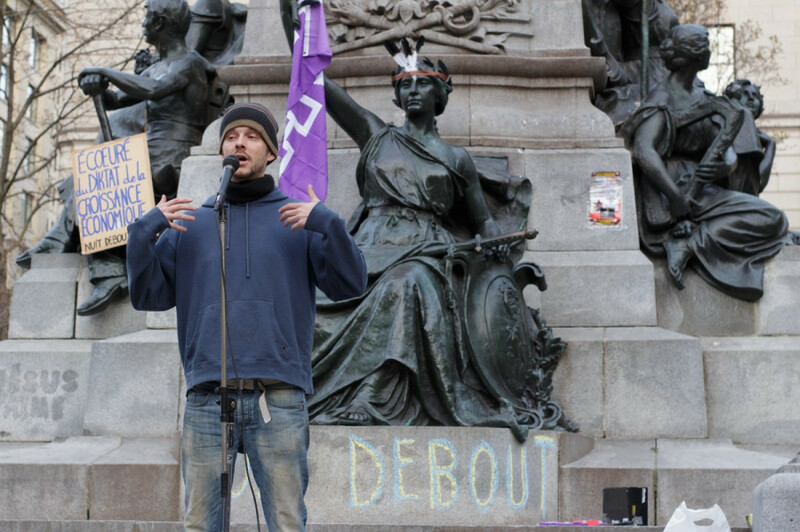 Nuit Debout began in France as an extension of the movement against a labour law reform. Described as a space of “convergence of struggles,” it has been organized around plaza occupations in various cities. It has since spread beyond France to multiple European cities, including some in Germany and Spain. The intention of the Montreal movement is to provide people with a platform in which they can speak openly about issues they feel are important in our society. Activists hold general assemblies in the square, where speakers can outline issues and call participants to action. Speeches ran from roughly 6:45 to 8:15 p.m., with upwards of 40 people taking the stage throughout the event to speak briefly in front of the King Edward VII statue, which had been redecorated with the purple flag of the Haudenosaunee Confederacy—the six indigenous nations which occupied this territory before the arrival of European colonizers. “I just want to see people come and talk, about politics, about everything—subjects that we aren’t so allowed to talk about,” explained Fabien Bianconi, 33, a Nuit Debout participant. Participants addressed a wide range of topics, from world hunger in light of the growing world population, to the Sykes-Picot agreement of 1916, which divided the Middle-East following the Ottoman defeat in World War I. People also addressed the Panama papers, wildlife preservation, a $15 minimum wage, feminism, and more. “There’s not enough space to speak about politics between people. It’s mainly between politicians. So we want to put it outside, with the citizens,” said Bianconi, who went on stage to speak a few times throughout the event. The microphone was open to anyone who wished to speak, and people were encouraged to take the stage. Police presence was light, with a few cruisers and officers on stand-by. The gathering finished with a screening of the film “Pipelines, Pouvoirs, et Democratie”—a documentary which focuses on the movement against the Energy East pipeline in Quebec. Nuit Debout is set to continue in Montreal, with another occupation planned for the evening of April 30 in the same location.